SPECIAL PRICING FOR TRAILBLAZERGIRLS! We are so excited to share with you our latest find that will have you pining for cold weather. The smart folks at EXO2 have some heated clothing options, and we were lucky enough to test the ExoGlo Women’s Freestyle Jacket. 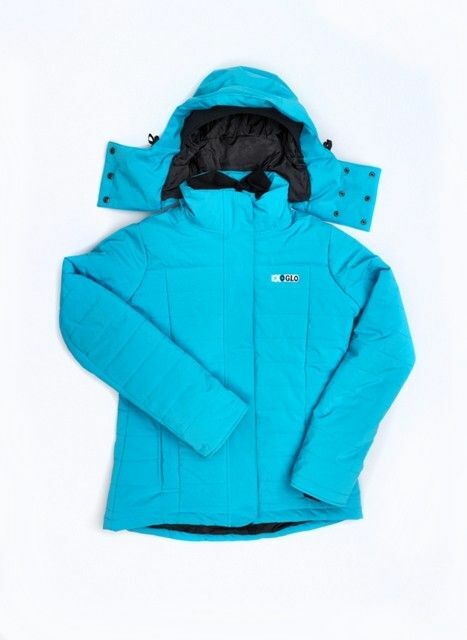 What sets this jacket apart is the high performance technical fabric and rechargeable power pack that heats this jacket quickly and efficiently with no wires or hot spots, just strategic panels (2 chest and 2 lower back) that keep your core warm. A bit of smart technology maintains a consistent temperature so you won’t overheat or unnecessarily run down the power pack, and a handy remote control enables you to adjust the temperature or turn off it off completely without having to access the power pack that is safely tucked away in a pocket. You will have no need for bulky, heavy sweaters under the Freestyle Jacket. The slim fit allows for a t-shirt or lightweight top to be worn even in the coldest of temperatures (and even without running the power pack – this jacket will keep you toasty!). Other thoughtful features include knit cuffed sleeves and a large collar to ward off the wind, a removable hood with a bill that shields your face from the elements without affecting your vision, and the waterproof, windproof, breathable fabric that allows for ease of movement. We LOVE this jacket, and we know you will too! Best of all, our generous friends at EXO2 are offering TrailblazerGirls a huge discount of 30% off of their Ladies Freestyle Jackets and their Lady Bodywarmers (vest version of the jacket). There are limited quantities and sizes so hurry and call them at 1-877-EXO2-HEAT (877-396-2432) to speak with a member of their Inside Sales Team to see what’s available. This is a super savings for some outstanding products – treat yourself and your TrailblazerGirl-friends to EXO2!